Dr. Gorodenker joins Northern Virginia Radiology Consultants as a board certified diagnostic radiologist beginning October 2018. Dr. Gorodenker attended the University of Rochester School of Medicine after completing his bachelor of arts at Johns Hopkins University. 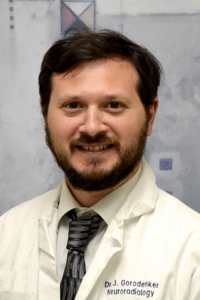 Dr. Gorodenker completed his residency at the George Washington University Hospital where he served as a Chief Resident in the Department or Radiology. After acquiring his board certification, Dr. Gorodenker completed fellowship training in Neuroradiology, also at the George Washington University Hospital, with rotations at the National Institutes of Health and at Children’s National Medical Center. Dr. Gorodenker most recently held positions as Associate Clinical Professor of Radiology at George Washington University, and Staff Radiologist and Medical Director of Imaging at Sentara Northern Virginia Medical Center in Woodbridge, Virginia.